Billy Clarke has netted 10 goals this season. 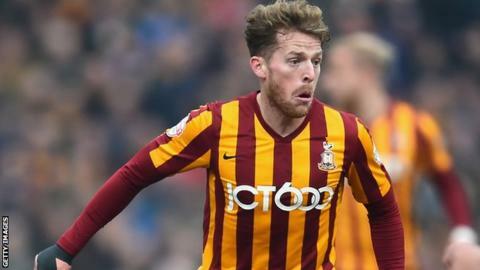 Billy Clarke scored twice as Bradford City leapfrogged fellow League One play-off hopefuls Oldham Athletic. The two sides were evenly matched in the first half, but Clarke broke the deadlock on 71 minutes. Gary MacKenzie and James Hanson combined to head the ball on for Clarke to add the finishing touch with a back-heel from close range. Clarke then put the result beyond doubt in injury time with a low shot from 15 yards after a lay-off from Jon Stead. Bradford sit in 10th place, two points off the play-off spot, while Oldham are 13th. "It's a tough afternoon when you come here, you know how Bradford are going to play. "They bang balls from back to front all day long into your box and you've got to be able to defend for 90 minutes and unfortunately we weren't able to do that." "We were chasing the game. We've changed the system three times in the game to try to get more up there and try to scramble our way back into it. "The disappointing thing is the way we conceded." Match ends, Bradford City 2, Oldham Athletic 0. Second Half ends, Bradford City 2, Oldham Athletic 0. Attempt missed. Carl Winchester (Oldham Athletic) right footed shot from more than 35 yards is just a bit too high. Goal! Bradford City 2, Oldham Athletic 0. Billy Clarke (Bradford City) right footed shot from the left side of the box to the bottom right corner. Assisted by Jon Stead. Billy Knott (Bradford City) wins a free kick on the left wing. Substitution, Oldham Athletic. Jordan Bove replaces Connor Brown. Substitution, Bradford City. Tony McMahon replaces Christopher Routis. Corner, Bradford City. Conceded by Jonathan Forte. Substitution, Oldham Athletic. Devante Jacobs replaces Danny Philliskirk. Attempt saved. Billy Clarke (Bradford City) right footed shot from the centre of the box is saved in the bottom right corner. Corner, Bradford City. Conceded by Adam Lockwood. Substitution, Oldham Athletic. Dominic Poleon replaces Luke Woodland. Goal! Bradford City 1, Oldham Athletic 0. Billy Clarke (Bradford City) left footed shot from the left side of the six yard box to the bottom left corner. Assisted by James Hanson. Corner, Bradford City. Conceded by Anthony Gerrard. Corner, Oldham Athletic. Conceded by Ben Williams. Attempt saved. Mat Sadler (Oldham Athletic) left footed shot from outside the box is saved in the bottom right corner. Attempt missed. Christopher Routis (Bradford City) right footed shot from outside the box is close, but misses to the left. Attempt missed. Jonathan Forte (Oldham Athletic) header from the centre of the box misses to the right. Gary Mackenzie (Bradford City) wins a free kick in the attacking half. Attempt missed. Michael Jones (Oldham Athletic) right footed shot from outside the box is close, but misses to the left. Substitution, Bradford City. Billy Knott replaces Mark Yeates. Mat Sadler (Oldham Athletic) wins a free kick in the attacking half. Attempt missed. Conor Wilkinson (Oldham Athletic) right footed shot from the centre of the box is just a bit too high.